Look closely. Look very closely. Is it ... a string of beads? Stars in the sky? Give up? Just turn the page and, lo and behold, it's an ochre sea star! See what looks like a bird's beak revealed as a gooseneck barnacle, blades of grass as a blue mussel, and many more surprises when you look closely along the shore. 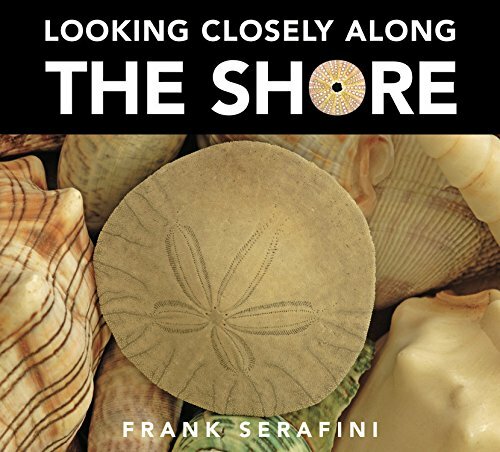 The Looking Closely series takes children on a journey of discovery through four environments --- the forest, the shore, the desert and the garden. Frank Serafini's camera lens enlarges each world through the magic of close-up photography. Young eyes will rediscover our planet as a place of beauty, mystery and delight. Readers are first challenged to guess the identity of each close-up photograph. The next page reveals the entire photograph of the plant, animal or natural object accompanied by a simple but detailed description of the habitat. By inspiring children to ask questions and use their imaginations, these books help build problem-solving skills. They also encourage curiosity about environments that, examined this closely, are full of unexpected wonders.